This is a sponsored post on behalf of Kitchen PLAY for Frigidaire Professional Collection and Lowe’s. As always, all opinions expressed are 100% mine. 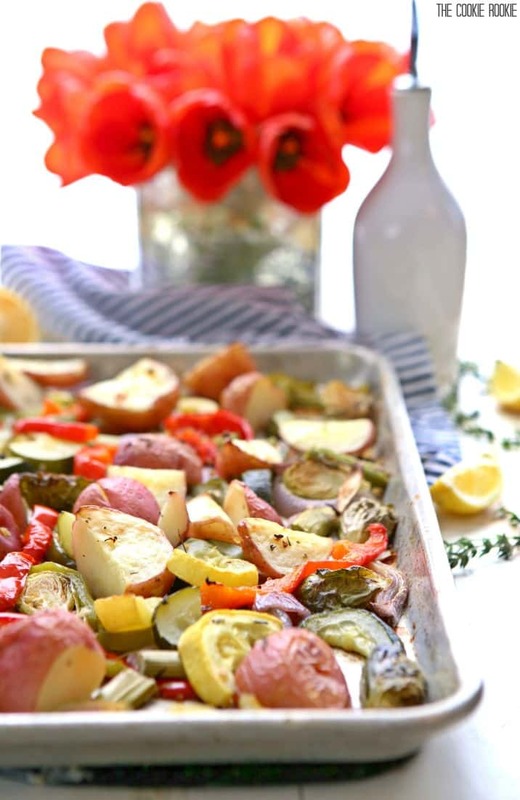 Simple Easy Roasted Vegetables are just what you need for a healthy side dish at dinner tonight. It doesn’t get easier (or more delicious) than Simple Roasted Vegetables. Colorful, beautiful, and oh so tasty! Finding healthy and easy recipes that also happen to be bursting with flavor is a constant struggle on the blog. Pat always tells me I should do more healthy stuff, but sometimes it’s so much easier to make the extra cheesy stuff… or the fried stuff… or the double chocolate stuff… you get the picture. 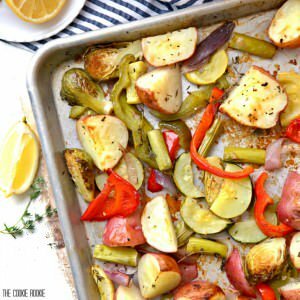 But recently I decided to give these Super Easy Roasted Vegetables a try, and WOW ARE THEY GOOD! Bursting with flavor, healthy, and extra delicious. The perfect side dish. Constant blog struggle conquered! I was recently looking over the new Frigidaire Professional Collection of appliances, and I WANT THEM ALL. I want the Self-Cleaning Gas Range, the Convection Oven Microwave with Sensor Cleaning Controls, and I REALLLLLLY want the Counter Depth French Door Refrigerator. I would have space to keep all of these delicious veggies crisp and fresh so much better than I do now. Please, Pat?? I even made this mood board to help plead my case to him! :) I call this look “Industrial Farmhouse Chic”. I need!! C’mon Pat! 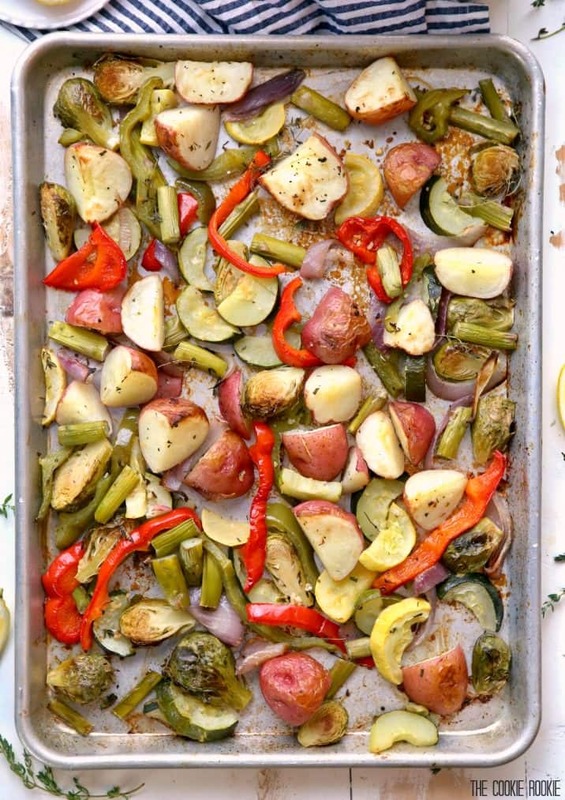 These Super Easy Roasted Vegetables need a new home! Be sure to check out all the amazing Frigidaire Professional Collection appliances at Lowe’s HERE. I think you’ll like what you see. I know I did! Also follow Lowe’s on Facebook, Pinterest, and Twitter; and Frigidaire on Facebook, Pinterest, and Twitter! 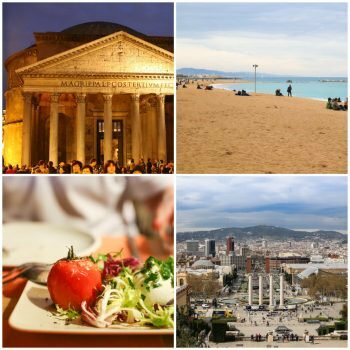 All the best products, updates, and deals! Wish me luck with convincing Pat. I did get my way on the deck build. We will see what happens! Enjoy the veggies! 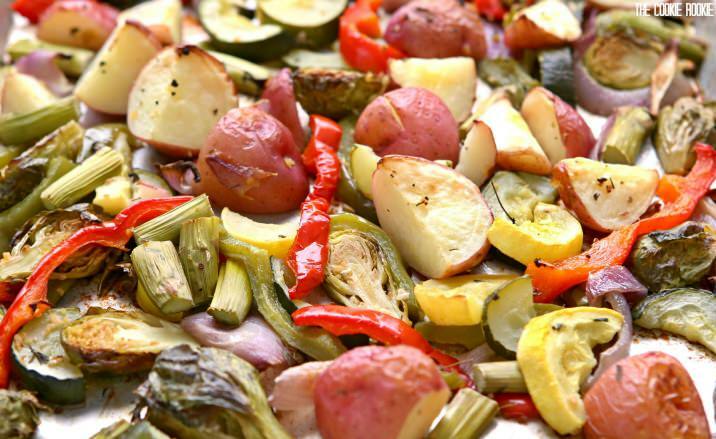 Simple Easy Roasted Vegetables are just what you need for a healthy side dish at dinner tonight. It doesn't get easier (or more delicious) than Simple Roasted Vegetables. Colorful, beautiful, and oh so tasty! 2 potatoes I used Yukon Gold, but any kind will work! Spray a baking sheet with nonstick spray Arrange veggies and garlic on baking tray. Some overlap is fine, but you want the vegetables to all touch the baking sheet if possible. Drizzle with olive oil and sprinkle with salt and pepper to taste. Bake for 30 minutes, then flip the veggies and bake for another 20-25 minutes. I knew if there was only one room in the house we could upgrade, it was the kitchen! As a food blogger, you need the room and the reliable appliances! As for these roasted vegetables, you cannot go wrong!! My husband tells me the same thing! I post a lot of not so healthy stuff and that isn’t how we eat on a regular basis. But it is hard to make that healthy stuff look good. 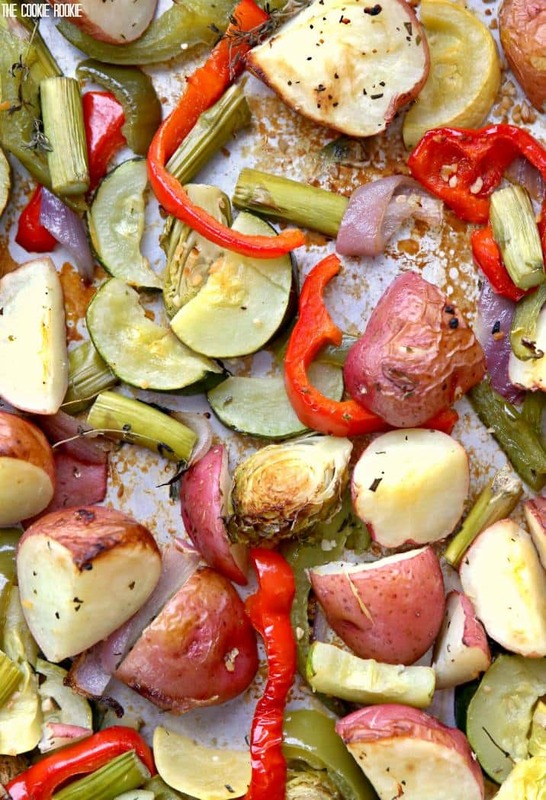 However, you did a great job making these roasted veggies look stellar! Great job and I wish you the best of luck convincing Pat for new appliances because they really do make a difference. I could easily eat an entire plate of roasted veggies myself. They are so easy to cook and are perfect for a healthy weeknight meal. I love the new Figidiare collection too! 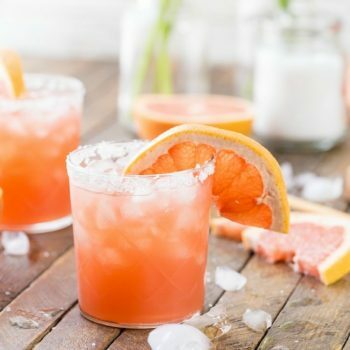 I love easy recipes like this! Great way to get your daily helpings of vegetables and so much flavor thanks to the garlic!! I could eat roasted veggies every day! They are so good and healthy! I made crescent rolls squares with ham, turkey, and cheese tonight…and that’s it. I could really use an accompaniment of nicely roasted veggies like these to make my meal a little healthier. You should like me!! Thanks for stopping by Thao! Those are exactly the appliances I am looking for too. I’m going to have to look p the measurements for that Fridge. Your vegetables are amazingly beautiful. I bet they are really flavorful and my husband will also love them! Isn’t that kitchen just dang gorgeous! 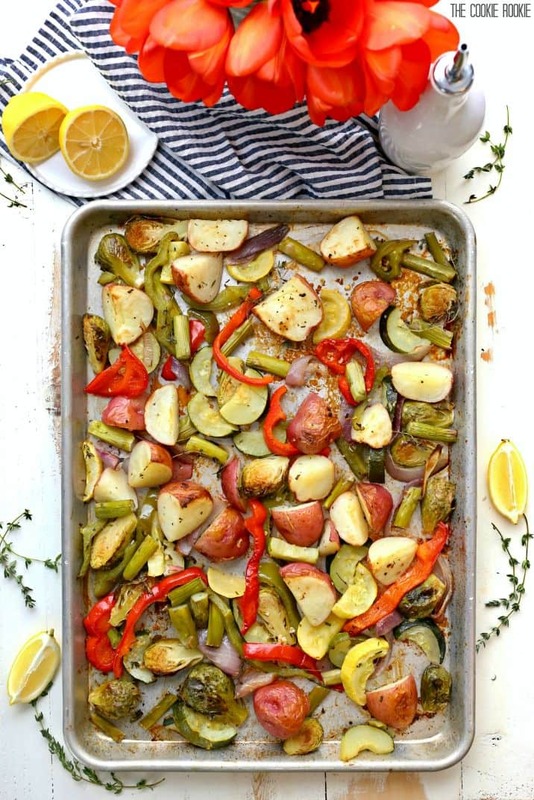 I’ll take your dream kitchen and a couple pans of these beautiful roasted veggies! !